Ye ha! Ride ’em cowboy | Blog the world!!! So who was I to resist the charms of Tupiza, the nearest town to the village where they may or may not have met their end. The moment I found out about Tupiza, I wanted to go. I knew it would be easy to convince Tim, he has his own fascination with cowboys albeit spurred by a very different screen classic. As we arrived into town I slipped in and out of various fantasies, one about being a vigilante cowgirl tomboy, there to save the locals from Biff like baddies. In another I am a glamorous but feisty small town girl who is surprisingly good with a gun on a horse. It was 3 am however and I was fairly sure that I’d need to sleep in order to live out my fantasies without falling asleep mid horse-ride and falling in a heap on the floor. 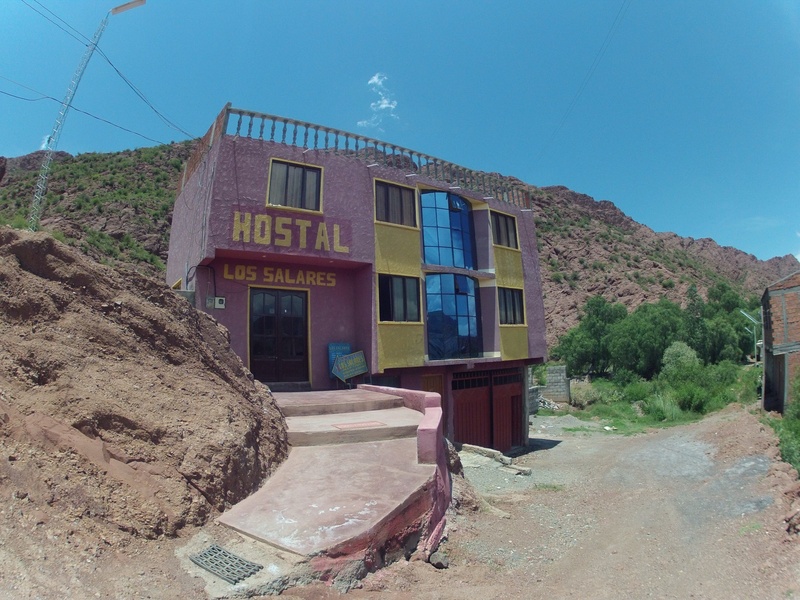 So we headed to Hostal Los Salares guesthouse. It’s a little out of town (walking distance) and perched on a hill at the bottom of some very red mountains. It doesn’t get more cowboyesque than that… apart from the inside, which was beautifully clean and comfortable with a different breakfast every day. The morning came and we went for a wander around Tupiza. It’s a small, dusty down with a cowboy statue and a big bank that looks suspiciously like one out of Butch Cassidy and the Sundance Kid. I have no idea if it is ‘the’ bank but in my mind it definitely is. There isn’t a lot to look at in the town itself, the main activities involve horse riding and biking down hills and trips to the Salt Flats in Uyuni. But it’s still very nice to walk around. It feels familiar and after a day you’ll recognise the cowboy gangs that swarm the streets (otherwise known as a pack of stray dogs all with their own personalities and none of them too terrifying – apart from barky who hangs out by the bus station, he’s harmless but loud). The mountains surrounding Tupiza are red like Mars and the ground is wonderfully yellow and dry just as you’d expect. Even better, there are cacti all over the place! So if you want a truly authentic cowboy experience without the guns and the stand offs, then come to Tupiza – cowboy land, Butch Cassidy land and the future… 3! What are you waiting for Cowboy, hit ‘em up!